SISTERS Magazines are now here in the US of A! Welcome to my online shop! I am an independent SISTERS Magazine distributor here in the United States. This fantastic magazine geared towards Muslim women, is one of the best Islamic magazines I have come across so far. 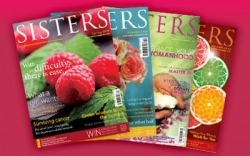 If you are interested in buying SISTERS, please do so by taking a peek look at my online shop: http://www.just4sisters.ecrater.com. The past, quarterly issues are $10.00 each, while the new monthly issues vary between $5.00 and $5.95. Starting January 2012, the magazine will be sold at $9.95, bulkier, bigger, and better. The January/February are combined issues packed with articles that you would easily relate to. Pay pal payments and checks are both accepted. For those living in the local Raleigh area, you can buy your copy (or copies) during one of the three jumu'ah (Friday service) shifts, or visit the IIPH Islamic bookstore in the Raleigh area. Buy SISTERS for yourself, your female family member, or friend, and earn innumerable rewards each time you read or your sister in Islam, reads an article that is very beneficial. New to SISTERS? Check out their website to get a feel of the content and who these sisters working for SISTERS really are: http://www.sisters-magazine.com/.